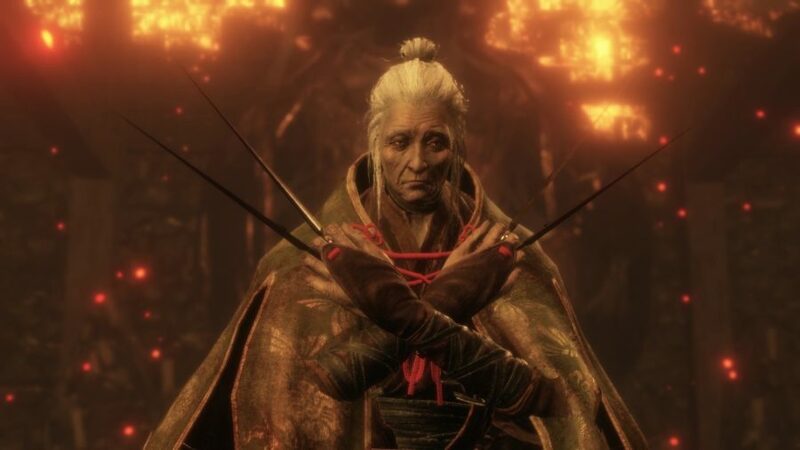 Struggling to defeat the Sekiro Lady Butterfly boss in Hirata Estate? It would be fair to say that the bosses in Sekiro are incredibly tough. Unlike in Dark Souls, there’s no hiding behind a great shield to get through the game, instead you’ll have to face your enemies head on. Lady Butterfly is available a couple of hours into the game and is incredibly difficult to beat if you don’t know the best strategies, making her a sizable obstacle for new players. In case you’re still not there, you can get to the Hirata Estate using a bell. The area has a lot of very useful items, but also some tough as nails battles, and the pinnacle of all of these is the Sekiro Lady Butterfly boss fight. Lady Butterfly is pretty much first major boss you fight depending on which path you take. She is hyper-aggressive, has strong ranged and melee attacks, and – spoiler alert – a secret second phase to boot. There are a lot of things to keep in mind while fighting her, but if you are fresh to the game you won’t have developed the good habits needed to take her out. It is frustrating and feels a lot like bashing your head into a kunai, but it is also a great opportunity to learn how to play Sekiro properly if you can be both patient and brave. If you want a fighting chance, then it is worth doing some prep before you go into the fight. It is wise to grab as many Gourd Seeds as you can, at least one health upgrade, and possibly your first attack upgrade. The last one isn’t essential, but if you find you’re struggling to dish out any real damage then it is worth tracking down. After the Outskirts Wall – Gate Idol is a mini-boss you can fight for a Gourd Seed and a Prayer Bead. Continue on past him to the next Idol and then fight and kill the Chained Ogre for another Prayer Bead. Behind him is a grapple point, go up to that and take an immediate left for another Gourd Seed. You can get two more Prayer Beads on the way to Lady Butterfly by killing the Shinobi Hunter and the Drunkard boss just before her. This will net you an extra two Gourd uses and a vitality boost. If you struggle with her after this, you could always go and kill off Gyoubu for an attack boost and buy the Gourd Seed from the Memorial Mob near his arena. But, all of this together should be enough to get yourself battle ready. This is the hard bit, obviously. Your natural instinct with Lady Butterfly will be to put distance between you and her. If you’re not confident at parrying yet, you can take her down by running around the arena and waiting for attacks you can easily punish like her kunai throw and heel drop. This will take a lot of time though, which doesn’t leave you much room for error. However, the best way to drop Lady Butterfly is by getting in her face and deflecting more than you attack. There are some attack patterns you should exploit. If you get in close and start swinging, she will block three of your attacks before she counter-attacks. When she counters hit deflect then attack three more times. If you follow that pattern alone, you will bring her posture down and open her up for a shinobi deathblow. The attacks you need to watch out for when executing this strategy in the first phase are signposted by the red kanji appearing overhead when Lady Butterfly is on the ground. When this happens, try to jump on her head and then hit the jump button again when she executes the attack – this will lower her posture and allow you to continue your assault. The other key attack to watch out for is when she jumps from wire to wire when above you. Just run around in a largeish circle and then running attack her when she lands. The second phase is very similar to the first, but she has a few new tricks. Some of her attacks will cause butterflies to attack you shortly after the main strike, which you can evade by running away and hiding behind a pillar. She also has a butterfly attack which comes with a sword flurry, so make sure you’re ready to smash the deflect key and then roll out of the way just as she goes to lunge at you. The other issue to avoid is that she will occasionally summon hordes illusions. The best thing to do here is to run around the room in a giant circle until they vanish – she will regain a lot of posture though, which can make the fight a little longer. Alternatively, you can use a Snap Seed to clear out any nearby Illusions and stay on the front foot. Other than that, the key to victory is the same as in the first phase. 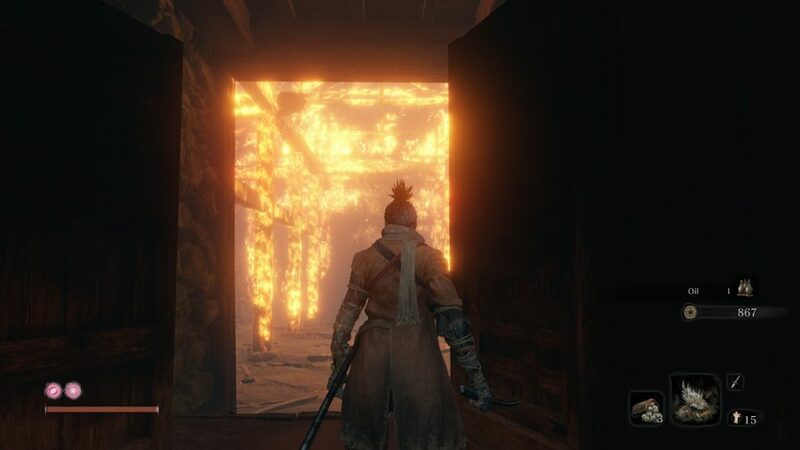 It may take a while to get this fight over with, but you will be a much better Sekiro player if you do so. There are a couple of ways to breeze past this ordinarily tricky opponent. One of these tactics involves stun-locking Lady Butterfly with the Nightjar Slash Combat Art. You can also squeeze a standard attack between each Nightjar Slash, and her attempts to block your swings will only deplete her posture further, leading some very easy shinobi deathblows.